Why the Administration decided to make this announcement by way of a supposed interview with Chuck Todd on Meet the Press is beyond me. Perhaps the viral video of Sean Spicer rendered him inapt. In any case, Miller has way too little practice on the Teleprompter and way too much horizontal gaze nystagmus to be the person to do the read. The Administration made its official statement today on the continuing expansion of Trump’s Immigration Enforcement actions. 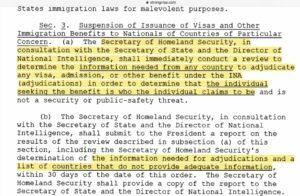 Miller’s Statement also confirms the infamous Travel Ban will be expanded to additional countries once the Trump Administration determines every country’s “security conditions” & “their ability to cooperate with us.” Remarkably, up to date assessments on internal security conditions for every country in the world (minus the seven already vetted) can be completed within 30 days as required by Trump’s well considered Executive Order. The Trump Administration is truly tremendous. Whether any country’s security conditions and their ability to cooperate with us via internal document controls, etc. such that their citizens should be banned from our country is being determined at a mind boggling rate of only 3 hours and 48 minutes per country. On February 26, 2017, a new countries of concern list will be promulgated based on the 3 hour and 48 minute study of each country in the world. All countries appearimg on the 2/26 list must comply with the new security measures by April 26, 2017 or their nationals will be excluded as unable to be vetted under Sections 3(a) and 3(b) of Trump’s January 27, 2017 Executive Order. @ 5:00 All components of Extreme Vetting will not be public. @ 5:30 There will be additional “routine online forms” in association with the new security measures. A Pundit observed Miller’s comments evince “an absurd lack of appreciation for the Constitutional Separation of Powers.” I agree. Miller appears to be saying there will be no refugees, no asylees, no diversity lottery, very limited family based immigration, and that every Work Visa Sponsor must prove there is no qualified American or Lawful Permanent Resident to fill the job for which the Work Visa is being sought. @ 10:20 Miller adds “multiple immigration violators who have been deported and re-entered” to the list of those whom the Administration is primarily concerned with. @9:00 Chuck Todd asks if simply being in the U.S. without status is enough to get you deported. 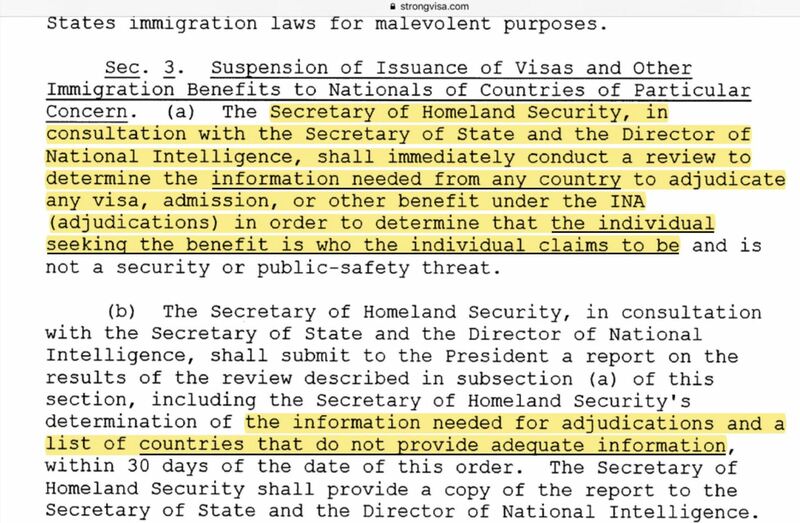 Miller responds the immigration Judge or an ICE Officer [via Expedited Removal] makes those decisions. Miller wrongly states the White House has no say. This is patently incorrect. As Commander in Chief, the President is explicitly tasked with ensuring DOJ and DHS enforce our laws. There is no jurisdiction or area of law in which every violator can be prosecuted. There are simply not enough resources to investigate, pursue, arrest, prosecute and punish every violator of every single crime committed. Any Agency Chief must decide how to allocate limited financial, human and infrastructure resources in such a way as to maximize the Health and Welfare of the People of the United States. This is a well established concept called Prosecutorial Discretion. Miller then goes on to say, “If people don’t like the immigration laws of the United States, they can reform them.” This comment is remarkably sanctimonious and presumes the ubiquitous idiocy of American Citizens. 5th Graders understand only Congress can legislate. Even if I were to interpret Miller’s statement magnanimously and presume he was referring to people voting for their State Representatives, Miller is being disingenuous in disregarding the quid pro quo that exists between lawmakers and Corporations since Citizens United. Miller further declares the failure of the U.S. to deport every single paperless alien or removeable Lawful Permanent Resident is to insult every victim of any alien who perpetrated a crime upon a U.S. Citizen. Simple logic and basic reasoning dictate any rational mind to correctly conclude the perpetration of a violent crime is a human, not systemic, failure. False equivalencies like this are used to inflame passions, arouse fear, and ignite anger. It is a propaganda technique most notably used against Jews in Nazi Germany. @ 11:30 Miller refuses to answer off script questions by twice declaring an oft exclaimed objection during jury trials, “Asked and answered.” It is a very odd response for a non lawyer like Miller to use not once, but twice– especially in the context of a supposed interview. As a student at Duke University, Miller reportedly was known to consider anyone who disagreed with him to be doing so out of stupidity or malevolence. Such presumptions are disturbing indeed as the former presumes a genuine sense of superiority and the latter, paranoia. A combination of personality traits in leaders history has proven lethal. This interview was unlike any I have ever seen except in vintage filmography. It is nothing short of astonishing to witness the use of the darkest propaganda techniques of yore sprint to life aggressively, unapologetically, and without any sense of obligation to obfuscate. It presumes the utter stupidity, ignorance and malleability of the audience upon whom these techniques are imposed.